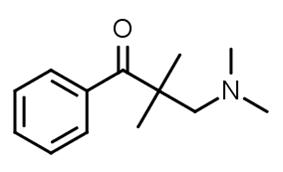 Dimethylaminopivalophenone is a a potent opioid analgesic. It was initially discovered by Russian scientists in 1954 and subsequently rediscovered in the US in 1969. Its LD50 in mice is 83mg/kg. ^ James H. Brewster, Ernest L. Eliel (2011). "Carbon-Carbon Alkylations with Amines and Ammonium Salts". Organic Reactions 7 (3): 99–197. ^ Edward F. Kleinman (April 2011). "Dimethyl(methylene)ammonium Iodide". e-EROS Encyclopedia of Reagents for Organic Synthesis. ^ Helmut Buschmann, Wolfgang Strassburger, Elmar Friderichs (24 January 2002). "Patent US 20020010178 - 1-phenyl-3-dimethylaminopropane compounds with a pharmacological effect". Retrieved 2 October 2015. ^ Manmohan S. Atwal, Ludwig Bauer, S. N. Dixit, J. E. Gearien, M. Magahy, R. Morris, C. Pokorny (November 1969). "Analgetics. II. Relationship between structure and activity of some beta-amino ketones.". Journal of Medicinal Chemistry 12 (6): 994–997. ^ "2,2-dimethyl-3-(dimethylamino)-Propiophenone". ChemIDplus. Retrieved 2 October 2015.